Honestly, I chucked this question in a remote corner of my mind thinking that it was still unrelated to my current situation. As J and K are only 10 and 7 respectively, it seems very remote that I have to ponder and explore this mind-boggling question. Not at least 5 or 10 years later. He handed me a letter and asked me to make an envelope for him. After some hesitation, he finally agreed. After reading the first two sentences, I nearly fell off from the chair. But I managed to contain the highly unusual emotional side of me and kept my composure like there’s nothing odd happened. I didn’t say much after reading the short letter and proceeded to help him make a simple envelope. Maybe he was honest. Or maybe he was trying to hide the answer from me. I don’t know. 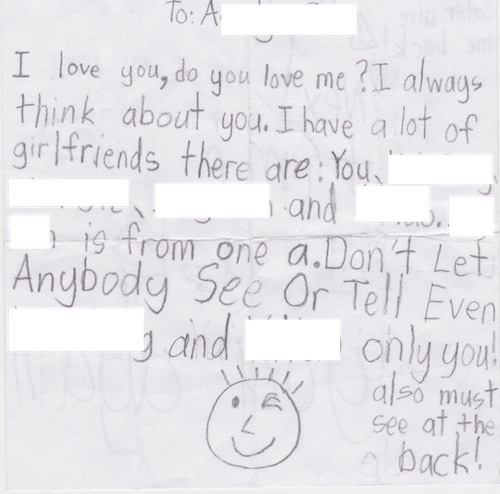 But what caught me in surprise was, in such a tender age of 7, he already started expressing his “love” in a letter to his classmate. If I remember correctly, I only started to have feelings for girls when I was 12. I know it’s sooner than me but I didn’t expect it to be so soon for my kids. Well, just don’t make a big fuss out of it. It’s just a process that everyone will go through. It doesn’t matter whether it’s early or late. Accept it as what it is. Go with the flow. You don’t need to pull your hair or grind your teeth. Just observe and enjoy how the lovey-dovey thing unfold. What? You want to have a look at the love letter? In fact, before I wrote this article, I have obtained K’s permission about sharing the story with my readers. To take it even further, I have “coaxed” him to allow me to scan his letter and post it on the blog. One final reminder: If you happen to know K, please don’t make a joke out of this when you meet him. I have spent a great amount of energy to convince him to allow me to share with you his story. Otherwise, if you do, there will be no more “juicy” gossip from him in the future. Seriously, I am not kidding.